If she can’t see it, she can’t be it. Such a simple but moving statement that is being used as the official slogan for the new 20×20 campaign that has been presented and launched by the Federation of Irish Sport and originated and developed by Along Came a Spider. 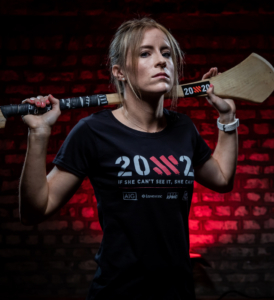 The 20×20 campaign for those who haven’t heard about it yet is a fantastic new initiative that was launched recently in Ireland with the exciting aim of creating a lasting impact that will result in a positive and permanent swing in terms of the overall perception of women’s sport in Ireland. The name of the campaign 20×20 refers to the 20% target that has been set as a goal to achieve by the year 2020 within different areas (media coverage, participation levels and attendance) that are so important towards achieving the 20% goal. 2019 is sure to bring similar success to 2018 and more Irish sporting moments for us all to enjoy. From cameramen to reporters, from preliminary qualifiers right through to national and international finals on a European and World stage. If she can’t see it, she can’t be it so let’s make sure she sees it everywhere she goes. At least then there can be goals set, dreams can become clear resulting in more participation, more support and an increase in quality and standards. Everyone’s a winner. 20×20 ambassadors and top Irish athletes Louise Quinn, Laura Twomey and Sarah Rowe sat down with us recently to chat about their involvement in the campaign. “It was a huge honour to be asked to come on board with this brilliant initiative.” said Dublin Camogie player Laura Twomey about the campaign. Professional football player with Arsenal and Ireland international Louise Quinn is a fantastic role model for young kids to have and with years of hard work now feels privileged to be in a position to give something back and get on board with the campaign. “I really was delighted and honoured!” reacted Quinn to the news about being asked to come on board. Mayo lady Sarah Rowe has excelled in recent years at the top of her game with Mayo Ladies football team, pulling on the green jersey and lining out for Ireland on a soccer pitch and most recently is enjoying playing professional sport in Australia having signed a season long contract with AFLW side Collingwood, just reward for the work she has invested in recent years to get herself to the top. 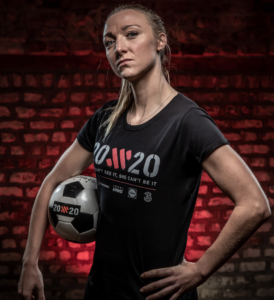 “It was an absolute privilege and honour to be asked to be an ambassador for the 20×20 campaign.” Rowe said when asked about her offer to come on board as a 20X20 ambassador. The promotional video for the campaign similar to the slogan is a simple one but with a very strong and moving message behind it. It begins with a number of young girls naming a long list of male sports stars and role models that roll off the tongue when asked but then switches to ask them to do the same with any female stars that they know of and between them not one is called out. “Watching the promotional video is quite shocking. Sometimes it takes something like that to really highlight the lack of visibility of female sports stars to younger girls.” reflected Dublin star Laura Twomey. “I think it’s all in the slogan really, “If She Can’t See It, She Can’t Be It.” That is so important, when sports women are seen it will become completely “normal” for a kid to be saying who their favourite sports stars are be it men and women. But we need to be seen!” explains Louise Quinn. Popular ladies footballer Sarah Rowe agrees regarding getting out to games and changing the perception around women’s sport so that it starts to become the norm instead of the rarity. “The best way for kids to see it is by going to matches and by having a little chat with the players after matches. “These small little things can have a life long lasting effect in such a positive way towards a kids outlook in sport and I don’t think people realise that what you say to a kid really can resonate with them for a long time so it’s really important that we are positively influencing kids. “I think if the kids see more billboards around the place on their way to school or wherever they may be going or see these players in magazines or while watching tv the more they see them in daily life the more of an impact and a memory they will have of them. In recent years there has been a huge amount of incredible work done in terms of investment in women’s sport and all of the work done to date by so many people around the country should be acknowledged and applauded as well. “Camogie has made huge strides over the past decade in terms of sponsorship and coverage. There was a time when only the All-Ireland Final was shown on TV but now it’s the quarters onwards” reflected Twomey. There are so many positives that can be taken when looking at how much women’s sport in this country has grown in recent years and also a huge amount of excitement and positivity as to the heights that it can still reach through initiatives like the 20×20 campaign. What would be deemed a success for the girls as ambassadors of this this campaign by the time the end of 2020 is reached and we are looking back over the results? I’d love for young children to be able to look up to their sporting heroes and for them to see both male and female stars” said camogie star Laura Twomey. All going well, by 2020 stars like Laura Twomey, Sarah Rowe and Louise Quinn will be joined by many more female role models and kids will be well on the way to achieving their own dreams by being able to see it right in front of them.